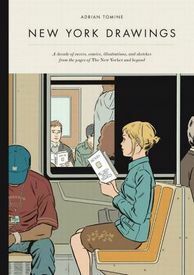 We wouldn't have believed it possible that Adrian Tomine has been appearing in the pages of The New Yorker for a full decade now if not for the fact that the credit pages for this volume plainly state that this is so. It's all here, along with plenty more, including: other illustrations inspired by New York City, among which – album covers and book covers; rare and "never-before-seen" sketchbook drawings; a new, illustrated introduction as well as "extensive" notes and commentary. Who would've guessed when those first Optic Nerve minicomics showed up that the journey their appearance marked the beginning of would lead to a career at The New Yorker? Not us, that's for sure! This attractive, oversize, full color hardcover volume is a Tomine treasure trove.